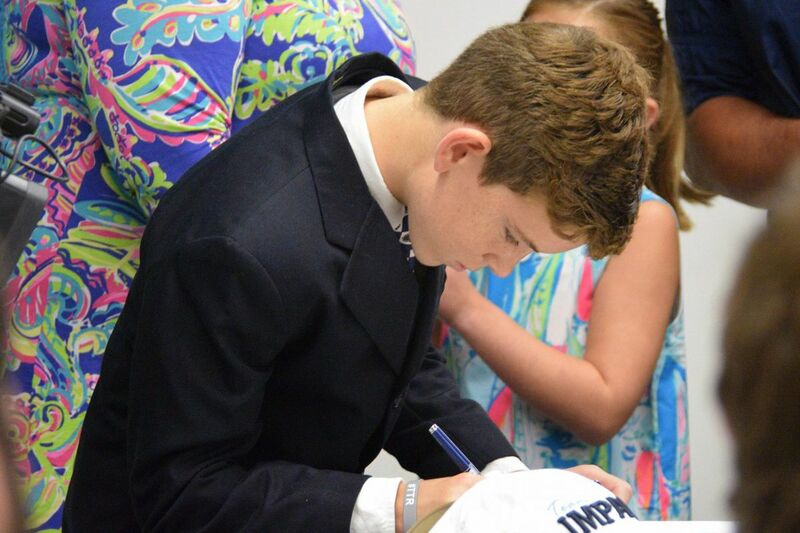 Jasper McHugh, a 12-year-old from Chester County who cannot play football because of a bleeding disorder, signs his "letter of intent" with Villlanova. On Tuesday morning, Villanova's football team officially made a dream come true. Jasper McHugh is a 12-year-old from western Chester County who loves football. But he's not allowed to play, because he has a bleeding disorder, which he inherited from his mother, Allyson. The Wildcats have adopted him through Team IMPACT, a Boston-based nonprofit that matches children suffering from life-threatening and chronic illnesses with college sports teams to improve their quality of life through the power of team. This was McHugh's special draft moment. The players assembled in the meeting room at the Talley Center to watch him sign the paper to accept his scholarship. The look on his face – and the family's – told you all you needed to understand. "It's actually hard to put into words what you've done for us," said his mom, who was joined by husband Larry and daughters Madison (who is older than Jasper) and Priscilla. "We're so grateful. His passion for the sport is just not something that can take place on the field every day." The relationship began last season with the help of the university's community relations department. Jasper has become a fixture at their practices. He even held the first-down chains during a recent scrimmage down the shore. He's going to be at all of home games and the close road games. There's even a chance he might go out to midfield with his guys as honorary captain for a coin toss. "I get excited, especially because it's Villanova," Jasper said. "They're my team." So what exactly goes on between him and the guys? "They're not usually asking me," he said with a smile. "I'm telling them." His father graduated from the school in 1999, and his mother worked there in the early 2000s. "We were hoping for Villanova," Larry McHugh conceded. "You look at things in life and say, 'OK, it's a shame he can't do this.' And then a team like Villanova just blessed us. They've totally embraced him." Since its inception in 2011, Team IMPACT has matched 1,200-plus children ages 5-15 with more than 450 colleges and universities in 46 states. There's a wait list of more than 1,000 teams looking to fulfill more dreams. "It's a joy to see him happy," Larry McHugh went on. "He could be doing like 30 fantasy drafts on any given day. So he gets to hang with a team, for a few years. He talks a lot of trash. You can see what it's done for him. His confidence level, even the way he's done in school, has improved. "He's actually a pretty good golfer. He's really good at reading greens. That's amazing to have, because I'm not," his dad said. Judging by the reaction, it's hard to tell who gets the most out of this — Jasper or his new-found heroes. "I remember meeting him in the spring," said senior offensive lineman Matt Donahue, from Garnet Valley High. "He got everyone pumped up. We loved it. You can see how much this means to him. It goes both ways. "It really puts things into perspective. A lot of time, we're getting up early and you're like, 'This [stinks]. This is hard.' Then you realize that you're able to go there every day and play football. He just wants to be a part of that." On Saturday, the Wildcats, ranked 10th in FCS, will open at No. 17 Lehigh in longtime assistant Mark Ferrante's debut as head coach. "It's just giving back," Ferrante said, proudly. "He's been gravitating towards our specialists, because they're not as active during practice and have more time. They've kind of really taken him under their wing. "We haven't given him the opportunity to put one between the uprights yet, but maybe we'll give him a peek." Hey, sometimes you never know what might be possible.